A kinetic model has been developed to study cancer growth. Cancer growth has been considered as interaction between various independent but interacting compartments. The model considers cell growth and metastasis resulting in the formation of new tumor masses. Using certain representative parameter values, cell growth has been modeled in the absence and the presence of various cancer therapies. Based on this analysis, the critical parameters involved in cancer development have been identified. This model may thus be useful in studying and designing a cancer therapy using the data obtained from specific in vitro experiments. Cancer has been a major area of research for several years and information is now available about how tumor cells evade the immune system of the body, and how they effectively get immortal. Chemo- and radio-therapies are currently the main cancer therapies for treatment/ control of the localized as well as invasive cancers. However, new treatment strategies are being studied so that a safer and a more effective cancer therapy may be developed. Recent studies have shown that cancer cells in case of several cancer types show high Epidermal Growth Factor (EGF) receptor expression on their surface and this is responsible for metastasis as well as self-induced proliferation. Besides metastasis, cancer cells induce angiogenesis to obtain nutrition, and to ensure survival and ability to proliferate . Based on these findings, attempts are being made to target EGF and/ or VEGF (Vascular Endothelium Growth Factor) receptors in order to reduce the rate of tumor progression, and eventually stop the tumor cells from becoming cancerous. Studies have demonstrated reduced cell growth, and degeneration of tumors upon treatment with anti-EGF receptor antibodies . However, most studies show positive results in vitro but may fail to be equally effective in vivo. This is possibly due to the interaction between different sub-systems of a body, which play a crucial role in tumor growth and development of cancer but could not be taken into account during in vitro experiments because of the complexity of the system. Therefore, it is important to relate the in vitro experiments to the in vivo situations to be able to predict the efficacy of a treatment strategy. Various models have been developed to study cancer development and tumor growth [3–6]. Some of these models have studied the tumor growth before it becomes invasive or during the early stages of invasion ; others analyze the stages in tumor development . Several models are based on the spheroid model or other related models to analyze the dynamics of antibody-drug therapy [5, 6]. 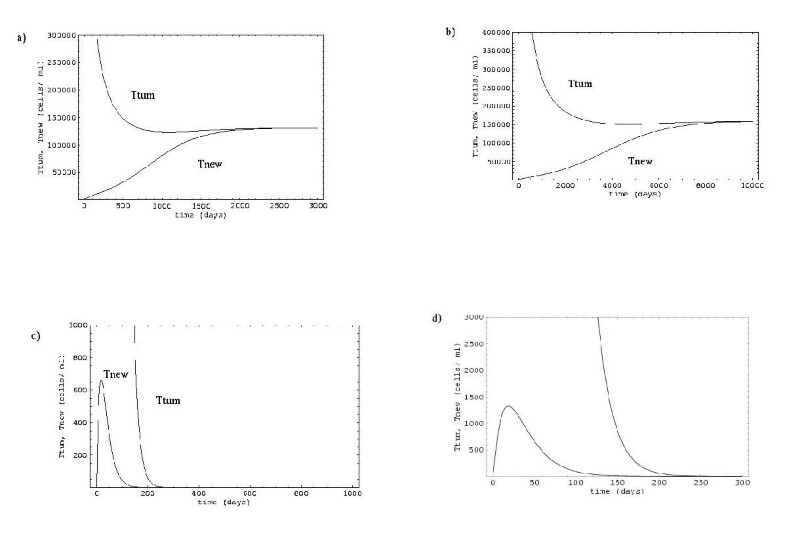 These models consider the diffusion of an antibody-drug into the tumor mass followed by the binding of the antibody to the tumor cell, and subsequent internalization of the antibody-drug complex. However, these models study the dynamics of an individual tumor without considering the effect of other tumors growing simultaneously in the body, i.e. the dynamics of the process as a whole is not considered. Thus, the previously developed models give a microscopic picture, which may not be useful in studying the efficacy and design of cancer therapies as the therapies act on a macroscopic scale. The kinetic modeling may be expected to be useful in the identification of the critical parameters that should be targetted in therapy. In addition to that, the requirement for a combination therapy may also be revealed from the kinetic modeling of the complete system. This can make the therapy more focussed and effective. In this paper, a kinetic model based on interactions between different compartments of a body has been developed. Thus, the kinetics of the process has been studied rather than the kinetics of a single entity. The model has thereafter been analyzed using a set of representative parameter values to demonstrate the utility and the applicability of this model. We have also shown how one can study and compare various treatment strategies using the developed kinetic model. and all kf's and kr's are the corresponding rate constants of the steps shown in Figure 1. All equations take into account the cell growth, loss into plasma due to metastasis, and attachment of the cells from plasma to the tissue. In the model, α, β, and δ are the relative drug efficacy factors depending on the therapy and its efficacy. These factors represent the effect a specific cancer therapy has on the different parameters. In the absence of any therapy, these factors are all equal to unity as the values are relative to the case when no therapy is being applied. Kinetic scheme depicting interaction between various compartments resulting in cancer growth. Three compartments have been considered- primary tumor, secondary tumor, and the plasma. The tumor cells are constantly exchanged between these compartments. Moreover, cells are cleared out by means of immune response and apoptosis due to the inability of cells to attach to the new tissue. This model, therefore describes tumor mass growth and associated metastasis. Depending on the parameter values, tumor growth in various stages may be studied. For example, by choosing the parameter values for the developing tumor, we can consider the initial stages when it does not metastasize and thereafter after a certain cell concentration, the parameter values may be changed to incorporate metastasis. In fact, once the new tumor has sufficient cell concentration, it can itself be considered as a source tumor and the cancer cell growth reanalyzed. On the other hand, the parameters may be chosen assuming that the tumor cells are constantly metastasizing. This assumption may be valid if the cell concentration limit for the cell to start metastasizing is orders of magnitude less than the steady state concentration it attains. Thus, this kinetic model is of a very general nature and a simplified form of the physiological situation, as there exists a far greater interaction between different compartments than what has been modeled. Similar compartmentalized model has previously been successfully applied to model HIV-infected patients . To study the dynamics of cancer growth, we have used certain representative values for the model parameters as tabulated in Table 1. All simulations have been carried out using Mathematica 4 (Wolfram Research). In the graphs thus obtained, we have plotted Ttum and Tnew as a function of time. This is important as during drug treatment or any other therapy, it is useful to know the concentration profile as a function of time such that different therapies my be compared. Representative parameter values used for simulating cancer cell growth. For the simulation of the cancer growth, the drug efficacy parameters have all been taken as one in the absence of any cancer therapy, as mentioned earlier. However, depending on the therapy, different values of α, β, and δ have been taken. The values of the drug efficacy parameters are shown in Table 2. The parameter values are mostly based on some experimental observations for various cancer types. We have taken the potential doubling time (Tpot) for the (human) tumor mass under consideration as ten days , though some tumors may have a slower growth rate. It is known that metastasis reduces the effective doubling time such that the observed doubling time may be few weeks to few months . Incorporating this information, we obtain the rate constant for metastasis for our model (kf1 and kr2). For the analysis, we have assumed metastasis to be a continuously occurring process. Since, cells are unable to attach to the endothelial tissue easily, the rate constants for attachment of cells to the existing tumor or to a new tumor has been taken as nearly 1% of the rate of metastasis. Based on a metastasis experiment done in mouse model , the initial conditions for the simulations as well as the rate of plasma clearance have been chosen. In the experiments that have been previously carried out [11, 12], a primary tumor was developed, which has been assumed to have a cell concentration of 3 × 106 cells/ ml based on in vitro studies  as well as the number of cells implanted in the mouse model . Thereafter, 2 × 105 tumor cells were injected into vein, and metastasis of the tumor cells was observed . 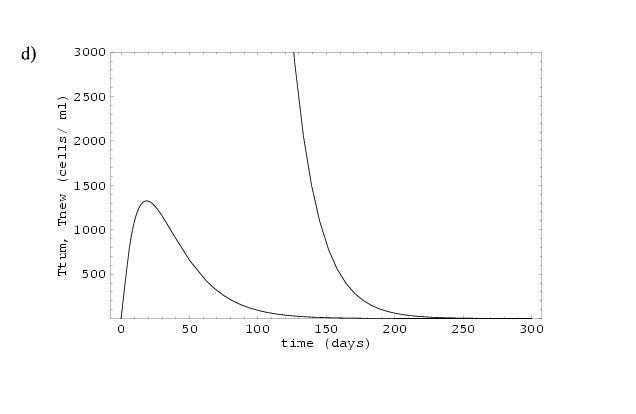 Assuming that tumor cells injected into the plasma at the beginning of the experiment correspond to the steady state cell concentration in the plasma, the rate constant for plasma clearance has been obtained. This may be valid due to the fact that the plasma volume is large, tumors may be localized or may not invade several tissues, and eventually steady state is reached so that the cells released by existing tumor either result in new tumors or are cleared out from the body. These factors result in the cell concentration in the plasma remaining nearly constant throughout. The variation in cell concentrations in the existing tumor, and the developing tumor in the absence of any cancer therapy has been shown in Figure 2(a). Different therapies considered are reduction in cell growth as well as metastasis by EGF receptor inhibitors [2, 13, 14], and reduction in specific growth rate and increase in clearance rate by activating immune response against cancer cells using therapies like adoptive therapy [15–22]. Figures 2(b) and 2(c) depict the cell growth in the presence of the two drug therapies- EGFR inhibitors and adoptive therapy respectively. Growth of existing tumor and new tumor: a) in the absence of any therapy; b) EGFR inhibitor therapy; c) adoptive therapy; and d) antibody-drug therapy. A single tumor leading to multiple tumors has been considered for analysis. The same analysis may be applied to all the existing tumors at any given time to study the kinetics of cancer progression in the absence and the presence of various cancer therapies. Cell growth in the absence of any cancer therapy has been depicted in Figure 2(a). The existing tumor cells grow and attains a steady-state concentration. At the same time, the tumor cells escape from the primary tumor and form a secondary tumor at a new site. Eventually, both the primary as well as the secondary tumors reach the same steady state cell concentration. This sigmoidal trend has previously been observed for tumor growth [7, 12]. Thereafter, the primary and the secondary tumors can result in formation of new tumors, and thus the cancer spreads to various regions of the body. In case of EGFR inhibitor therapy, the effective value of specific growth rate (r) and rate of metastasis (kf1 and kr2) decrease, and this subsequently results in slower tumor growth of the existing as well as the developing tumors (Figure 2(b)). However, unless the inhibitor efficacy is sufficient enough to decrease the rate of cell growth to less than the rate of cell clearance from plasma, cancer cells cannot be eradicated from the body and the effect is merely to delay the cell growth (which in this case is by a factor of ~4). This extension may be helpful if there is any subsequent and/ or parallel treatment. The reduction in the cell release rate may in fact result in higher steady state cell concentration in the primary tumor thereby, partially or totally overcoming the effect of the reduction in the cell release rate constant. However, if the EGFR inhibitor therapy is combined with other treatment(s) that can further reduce the rate of cell growth, then tumor degeneration may be observed. In contrast to anti-EGFR treatment, the model predicts that the adoptive therapy may lead to a nearly complete elimination of new as well as existing tumors. The parameters affected by adoptive therapy are r and c, i.e. rate of cell growth decreases and rate of plasma clearance of cells increases, as the immune response destroys the tumor cells in the tumor masses as well as in the plasma. 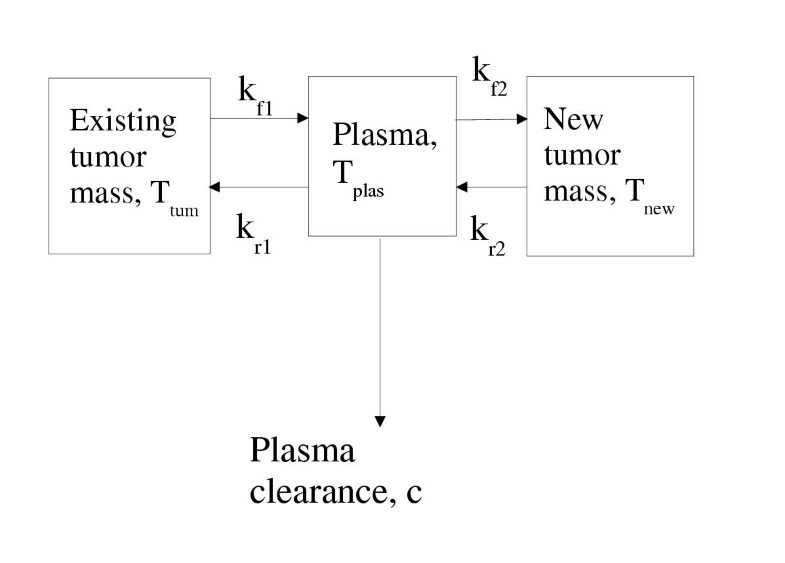 As seen in Figure 2(c), a small reduction in specific rate of cell growth and an increase in plasma clearance can result in complete removal of cancer cells from existing tumors in a matter of few months and it also ensures that the new tumor masses are not able to reach the high concentrations. These new tumor masses also degenerate progressively and thus, the cancerous cells are completely eliminated in a few months. Since, this form of treatment is relatively fast compared to any combination therapy involving EGFR inhibitor therapy, this may even be used for cancers in advanced stages. However, activation of immune response against cancer cells itself is a big challenge. This is so because cancer cells are able to escape immune surveillance by shedding the antigen peptides on their surfaces, and by releasing blocking factors, which can neutralize the NK cells [22, 24]. In this direction, various strategies are being explored like adoptive therapy, dendritic cell vaccine and enhancement of NK cell activity through IL-2 . One way to overcome this limitation is to activate an immune response against the blocking factors themselves. In that way, all the blocking factors may be neutralized so that the TNF/ IL-1  or NK  can destroy the cancer cells in the tumor as well as in the plasma. After activating the immune response against the blocking factors, NK cell activity may be enhanced by priming them with IL-2 depending on the state of cancer and the NK cell activity. Lastly, therapies like antibody therapy with antibody-drug targeted against the cancer cells, and anti-angiogenesis therapy decrease the rate of cell growth keeping rate constant for cell release from the tumor unchanged. In that case, tumor degeneration is observed (Figure 2(d)). This may be explained by the fact that the balance between cell growth and cell clearance is disturbed and this may result in smaller tumors and/or eradication of tumor masses. The degeneration of tumor mass with antibody therapy assumes that the antibody is accessible to all the tumor cells, which is not the case in physiological situation. In this way, we observe that cancer growth can be modeled by considering the cell growth and metastasis as interaction between various compartments. Using this model, various cancer therapies may be compared for their efficacies, and may be focussed to result in a better and an effective therapy. However, we would like to point out that these results are based on the parameter values selected for the analysis and therefore, the true efficacy of a therapy can be realized only after carrying out analysis with the corresponding parameter values. In addition, the results depend on the efficacy of a therapy, i.e. the values of the drug efficacy factors determine the efficacy of a therapy. The actual effect of any therapy will depend on the drug efficacy parameters but from this analysis, we infer that the reduction in specific growth rate of cells is primary, and the rate of cell release from the tumor masses should not be decreased substantially for the success of the treatment strategy. Thus, these results should not be taken as a means to accept or reject a therapy, but should rather be used for improving and designing the cancer therapies. Cancer growth has been modeled as the growth as an existing tumor and metastasis resulting in interaction between the existing tumor and plasma viewed as two independent but interacting compartments. The cells present in plasma, thereafter attach to another tissue and grow into a new tumor mass. The new tumor mass increases in size due to cell growth and cell uptake from plasma. However, once the cell concentration reaches a steady state concentration, this tumor mass also becomes a source for new tumor masses, i.e. it forms another stage for cancer growth. Further, two different cancer therapies- EGFR inhibitor therapy and adoptive therapy- were analyzed using this kinetic model. The results point to the importance of targeting the specific growth rate as well as the plasma clearance rate in the system. Thus, this model helps study the efficacy of the cancer treatment therapies, and also helps determine the critical factors, which may be targeted. However, these results are strongly dependent on the parameter values, which should be appropriately taken and analyzed for specific case; but this model is useful in focussing and improving a cancer therapy in order to make it more effective. SJ would like to express sincere acknowledgements to Prof. D.J. Irvine, MIT for the support during the course of this work. SJ would also like to thank Alireza Khademhosseini for critical comments during the preparation of the manuscript.